A film will tell the true story of Karen rebels who hijacked an airplane in 1954 with hopes of finding Japanese weapons hidden in the mountains. RANGOON — At 2 am on June 25, 1954, 28-year-old Maj Saw Kyaw Aye from the Karen National Defense Organization (KNDO) couldn’t sleep. Instead he stayed awake, talking with his colleagues, Capt Thein Kyaw and A Nyein, about the next day’s mission: a trip to Rangoon airport, to pull off the first-ever airplane hijacking in the country. After Burma achieved independence from the British in 1948, there was considerable tension between the ethnic Karen community and the ethnic Burman majority, which dominated the new government. Some Karens sought autonomy, while others hoped to co-exist within Burma. The KNDO, which later become the Karen National Liberation Army (KNLA), was an armed organization formed by the Karen National Union (KNU) in 1947 to defend the interests of Karen communities. Most KNDO soldiers had previously served in the forces of British-ruled Burma. In this story, Saw Ba U Gyi, the first president of the KNU, was also a player. After independence, he urged Burma’s first Prime Minister U Nu to respect equal rights for all under a democratic system, but he received no response. Not long after, he was shot and killed by Burma Army troops in Karen State in 1950. Following that death, KNDO troops were weakened—facing not only military attacks from the government, but also political attacks. The ethnic rebels struggled with a lack of financial support, medicine and weapons, leading to low morale. At that time, Saw Kyaw Aye, the sleepless KNDO major, was searching for a way to bolster the ethnic rebel forces. Looking for a way to defend against the government army, he wanted the KNDO to access heavy weapons that had reportedly been hidden by Japanese troops somewhere in the Dawna mountain range of Karen State. But there seemed to be just one way to do that: via airplane. Saw Kyaw Aye’s resulting exploits are chronicled in “The World’s First Hijacking of Burma,” a book by writer Hla Thaung that was published in April this year. Despite the title’s suggestion, the airplane hijacking was not actually the world’s first, although it was Burma’s first. Twelve years earlier, British pilot Ted Strever reportedly hijacked an Italy-bound sea plane after being captured as a prisoner of war during World War II. Saw Kyaw Aye’s hijacking team—which included Thein Kyaw and A Nyein—used fake names to buy Union of Burma Airways tickets from Rangoon to the Arakan State capital, Sittwe. The Dakota plane was scheduled to make the flight on June 25, 1954, with 14 passengers and four airline staff. A monk, a woman and military officers would be among those on board. 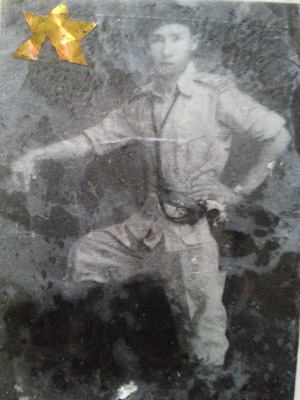 KNDO’s Maj Saw Kyaw Aye in 28 years old. photo courtesy to Anthony. The plane took off, and the hijackers were armed with pistols and hand grenades. Three hours into the flight, they urged the pilot, A.E. Hare, to land prematurely, but their intended landing point was not open. Instead, Saw Kyaw Aye decided to land the plane in Magyizin village, Gwa Township, Arakan State. He hoped to fly to Karen State’s Dawna mountains, but he lacked enough fuel to take off again. Also on board the plane was a government-owned box of 700,000 kyats (US$700), guarded by a military officer. The hijackers had not known about the box, nor had they intended to take it, but given the fuel situation, they decided to steal the money, hand over control of the plane, and flee. In 1959 Saw Kyaw Aye’s collaborated with the government—peacemaker between Karen rebels and the government. Until the 80s. still kndo. Then religious affairs. The hijacking made headlines in Burmese newspapers at the time and is now coming back into the spotlight, with Rangoon-based film director Antony planning to turn the true story into a film this year. The expected cost of the film project is 300 million kyats, and Thailand-based Gear Head Co. Ltd. will offer technical support. The producer and director is eager to cast up-and-coming actors for the project, with training from more experienced artists. The 60th anniversary of the hijacking will be next year in June, and the director aims to release his film at that time, though he is somewhat worried about potential difficulties in arranging screenings at movie theaters in Rangoon. “If I can’t show at that time here, I will attempt to show the film at international theaters,” he said. About 30 actors will participate in the project, and the director aims to film in the historical landing point of Gwa Township, but he says he will need to check whether the area is suitable for a large indoor studio, which will be necessary for scenes inside the plane. “I’m so excited to make this film. It’s a really big job. I will put some romantic scenes in too,” he said. One challenge will be finding a Dakota plane, as there are only two of the aircraft left in Burma—one is used by the Air Force and one by the Army. The rest have been put in a museum in Rangoon. “So maybe the Thai company can help us get a new Dakota,” Antony said. Grace Swe Zin Htike, a former actress and current secretary of the Myanmar Motion Picture Organization, has been recruited to train the film’s acting crew. She said she expects the film to be positively received internationally. The film premier is expected to be held on the full moon day of Tazaungmone in November.